The 2011 Edition: Why Do They Hate Us? As the National Journal put it in a December 4 article, a US "covert war" against Iran has already begun. This secret war--at least secret from the American people--is being conducted in part directly by the US, as evidenced by the advanced American RQ-170 Sentinel stealth surveillance drone just recently downed--apparently by sophisticated electronic countermeasures that allowed the taking control of, and landing of the vehicle--by Iran. Also conducted in part of proxies, including the Iranian anti-government terrorist organization MEK (for Mujahideen-e Khalq), and of course Israel's Mossad, this dirty covert war has led to an escalating string of acts of terror inside Iran, including a campaign of assassination against Iranian nuclear scientists, and bombings of Iranian military installations. Not content to simply engage in such illegal hostilities against a sovereign nation that has not threatened the U.S., and that in fact has not invaded another country in some 200 years, President Obama had the effrontery to demand that the Iranians return the spy drone that they had captured! 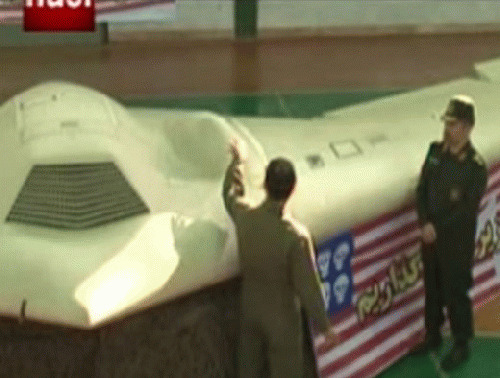 Imagine for a moment if an Iranian, or some other nation's, robot spy plane had been captured or shot down over U.S. territory. Imagine the official response if the nation that owned that plane were to demand its return! First of all, Congressmembers, probably almost unanimously, would be clamoring for the US to launch an attack on whatever company launched the spy plane. But the reaction to a demand to return such a device would be truly explosive! The audacity! Actually, you don't need to imagine. Look at the right-wing media and the official US government response to the arrest of two men in New York accused of the hard-to-believe conspiracy of planning, allegedly at the direction of Iranian government sources, to assassinate the Saudi ambassador to the United States. Forget about proving that this far-fetched alleged plot was real at all, and not just another creation of some FBI informant/provocateur, or whether Iran was really behind it even if it was. There were open calls for bombing Iran immediately! President Obama, meanwhile, keeps saying that "all options are on the table" for dealing with what the US government alleges is an Iranian campaign to develop nuclear weapons -- itself a very dubious claim. And to back up that threat, the US has actually delivered huge non-nuclear "bunker busting" bombs to Israel, a country which has openly been discussing plans to attack Iran.